Listeners of the Silk Royal Showcase radio show are already well aware of Zack Roth, a phenomenal talent, whose "Tekkadon" was a highlight of the recent SRS 01 compilation. Zack has been a featured DJ at the biggest NYC clubs (Pacha, Cielo, Webster Hall) for years now, and his recent productions have been met with similar fanfare. 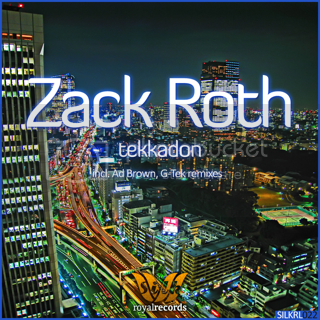 Specifically, Zack's Original Mix of Tekkadon has already been supported on the radio shows of Andy Moor, Myon & Shane 54, James Grant, and more. The Original Mix begins with a slowly filtered in bassline, as the gorgeous central pads soar overhead. After this glorious intro, the atmospheric elements drop out, and we are left with a gut-busting bassline. Soon thereafter, stunning arp lines enter the fray, leading into the anthemic breakdown. The lead melodies in the break evoke a voyage to the Far East, seemingly inspiring the culinary-referenced title. remixes in the package. Ad, who is currently in the midst of a busy 6-month DJ tour of Asia and Australia, offers a lovely intro mix. In the very beginning, signature Ad Brown pads and arpeggios form a blissful soundscape, while still staying true to the melodic themes of the source material. After the extended string intro, a rolling bassline propels the track forward, while Ad's arp lines dance above. In the main break, a new flute-based lead supports the beautiful atmosphere created by the sweeping strings. G-Tek, who, like Ad, has contributed greatly to Silk in the past and who has also worked with Armada and other elite labels, offers a take-no-prisoners club take. This virtuoso Panamanian producer, also known as Orlando Garcia, has re-imagined the memorable original bassline to better suit his signature style and has added vintage 80's-influenced percussion. The drop following the main break is a true release highlight, as a club-killing bassline groove is supported by a series of highly creative fills. JASON JOLLINS with Zack Roth | Friday, December 10th | District 36!